Superior Pump builds pumps that are truly Built to Last and are 100 percent factory tested. Superior Pump uses quality components including solid copper motor windings, heavy duty stainless steel jacketed shaft seals, double o-ring seals on motor plate, and electronically controlled split capacitors. 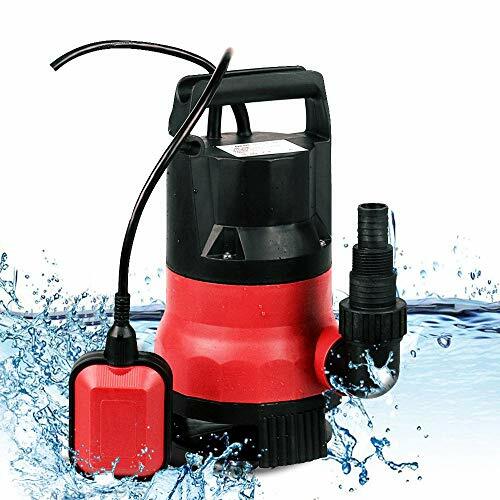 Superior Pump model 91250, 1/4 HP thermoplastic submersible utility pump with 10 foot power cord and -inch garden hose adapter, will move water up to 1800 gallons per hour. Equipped with suction screen to filter out large debris and handles up to 1/8-inch solids with ease. Base of the pump is designed to fit the hub of a standard 6-inch floor drain. This pump is UL/CUL listed and CSA certified and backed by a 1 year warranty. 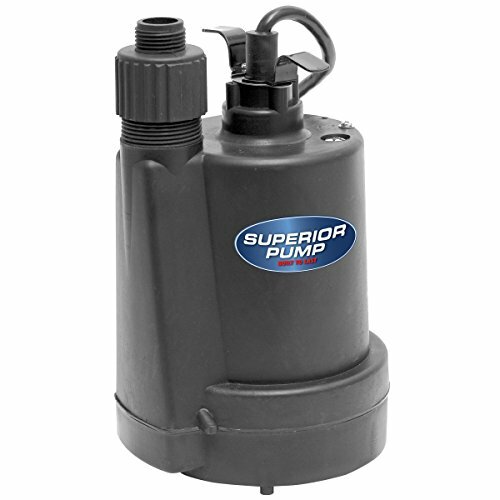 The Superior Pump 1/4-Horsepower Submersible Utility Pump offers exceptional power in a small, durable frame. 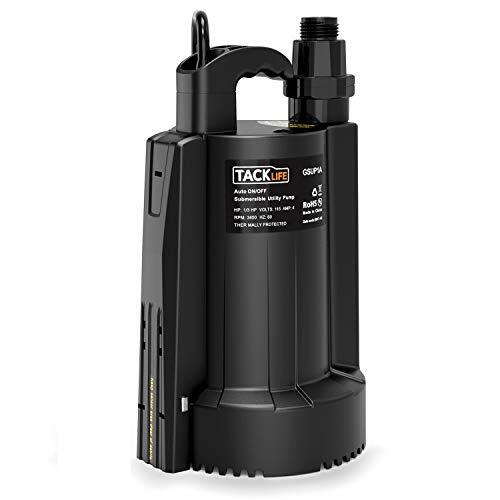 Able to pump 30 gallons a minute up to 25 feet of vertical height, this tough submersible pump features durable thermoplastic construction and a compact design that can fit inside a 6-inch opening. 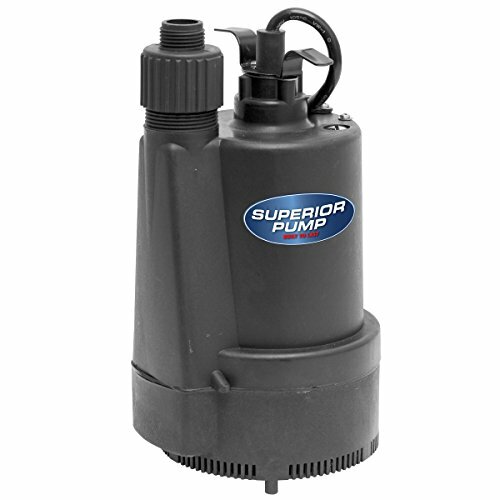 Designed to drain standing water from any enclosed environment, the Superior Pump is ideal for flooded basements, farm use, and typical residential or commercial water transfer applications. An optional float switch can be added to allow this model to be used as a sump pump. Click here to see the cutaway view. 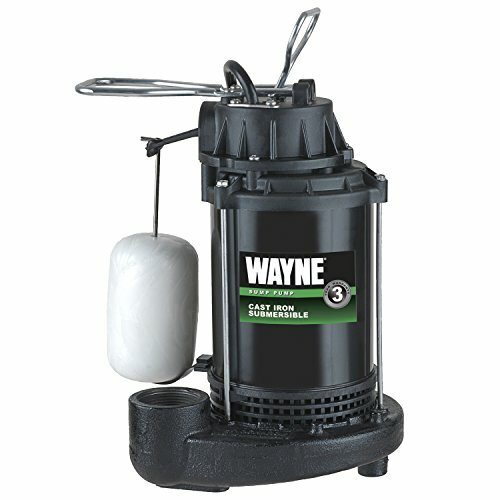 Continuous duty motor can pump up to 30 gallons a minute and lift water up to 25 feet vertically. View Larger. Top discharge is perfect for tight spaces where water removal is needed; window wells, buckets, etc. Eliminate standing water in your yard, and the risk to attract mosquitos. Use the WaterBUG to stop the bugs! Superior Pump builds pumps that are truly Built to Last and are 100 percent factory tested. Superior Pump uses quality components including solid copper motor windings, heavy duty stainless steel jacketed shaft seals, double o-ring seals on motor plate, and electronically controlled split capacitors. 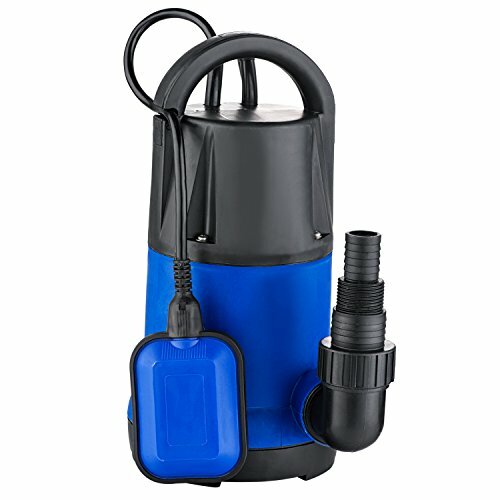 Superior Pump model 91330, 1/3 HP thermoplastic submersible utility pump with 10 foot power cord and -inch garden hose adapter, will move water up to 2400 gallons per hour. Equipped with suction screen to filter out large debris and handles up to 1/8-inch solids with ease. Base of the pump is designed to fit the hub of a standard 6-inch floor drain. This pump is UL/CUL listed and CSA certified and backed by a 1 year warranty. 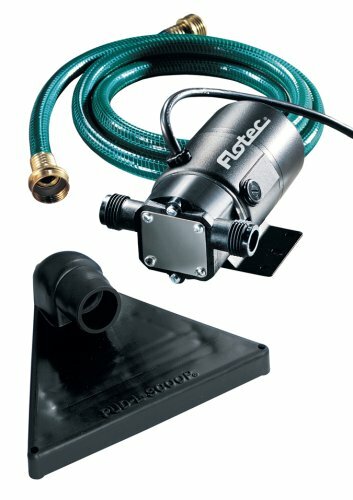 3/4 hp, cast iron/stainless steel, submersible sump pump, with vertical switch, designed for 11 inch diameter or larger sump basin, pumps up to 4600 gph at 0', durable cast iron volute, reliable, reinforced poly carbonate impeller, corrosion resistant stainless steel motor housing & fasteners, top suction design filters debris & minimizes clogging, oil filled, thermally protected motor prevents overheating, designed for easy installation without any Plumbing changes, epoxy coated steel, high performance 3/4 hp, motor, 1-1/2 inch NPT discharge & durable cast iron base, easy carry handle for portability, float guard protects switch from hang ups, 5 year warranty. This product is assembled in the USA. Easy installation and easy handling. 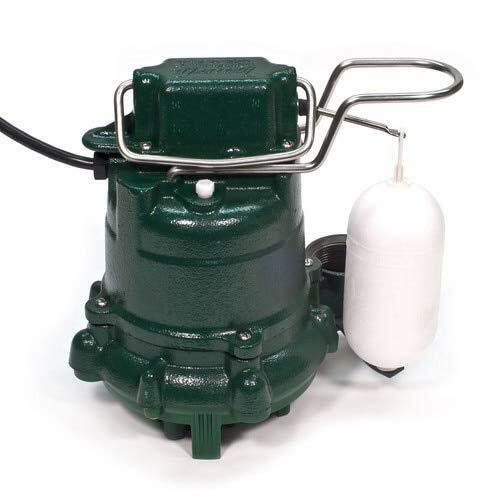 1/3 hp, cast iron, submersible sump pump, with vertical switch, pumps up to 3800 gph at 0', designed for 11 inch diameter or larger sump basin, top suction design filters debris & minimizes clogging, designed for easy installation without any Plumbing changes, epoxy coated steel, high performance 1/3 hp, motor, 1-1/2 inch NPT discharge & durable cast iron base, easy carry handle for portability, float guard protects switch from hang ups. The product is manufactured in china. Easy installation and easy handling. Assembled in the US with foreign and domestic parts. BEFORE FIRST PLUGGING IN, PLEASE FILL WITH WATER INTO THE PUMP HEAD. 1/10HP power with max output 330GPH. 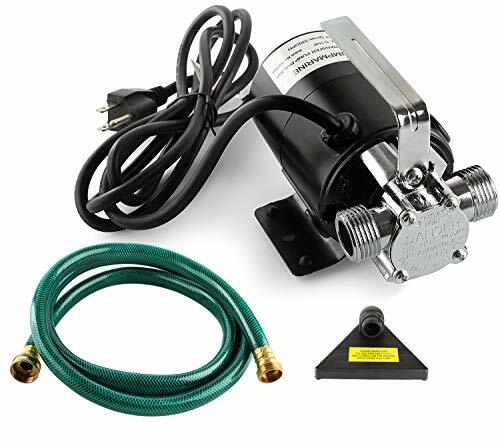 Light weight, Portable Pump with metal hose connectors to a standard garden hose. Ideal for everyday household water transfer requirements. Perfect for water distribution such as watering lawns or gardens. Great for draining waterbeds, clogged sinks, and aquariums. Superior Pump builds pumps that are truly Built to Last and are 100 percent factory tested. Superior Pump uses quality components including solid copper motor windings, heavy duty stainless steel jacketed shaft seals, double o-ring seals on motor plate, and electronically controlled split capacitors. 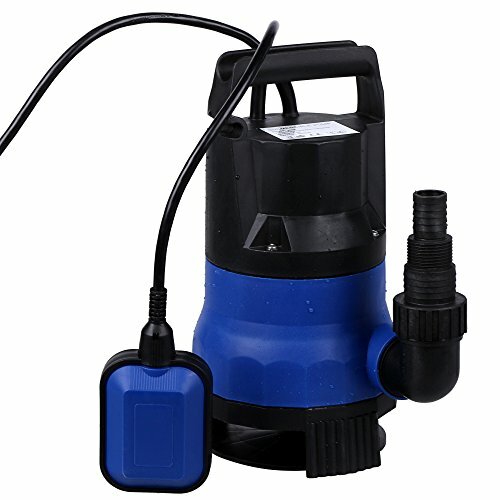 Superior Pump model 91025, 1/5 HP thermoplastic submersible utility pump with 10 foot power cord and -inch garden hose adapter, will move water up to 1560 gallons per hour. Equipped with suction screen to filter out large debris and handles up to 1/8-inch solids with ease. Base of the pump is designed to fit the hub of a standard 6-inch floor drain. This pump is UL/CUL listed and CSA certified and backed by a 1 year warranty. Most homeowners discover that their sump pump has a problem when the basement is already flooded. PumpSpy's sump pump smart outlet contacts homeowners that their sump pump has a problem before flooding can occur. The sump pump smart outlet connects to the free PumpSpy monitoring service that constantly watches your sump pump automatically, 24/7. The PumpSpy sump pump smart outlet works with any 120v sump pump. 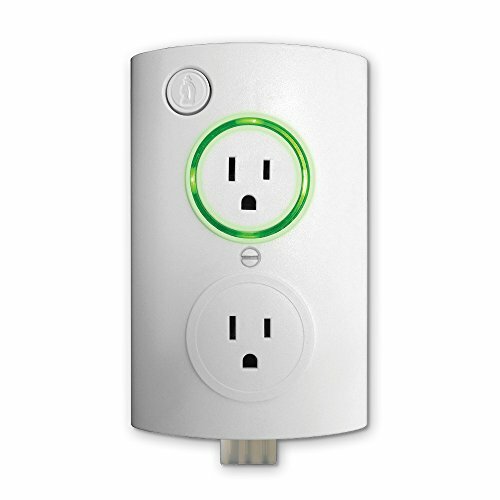 Simply connect the smart outlet to your Wi-Fi network and plug in your sump pump! PumpSpy's computers will automatically track incoming data from your sump pump and check that the pump is working properly. If any issues are detected, PumpSpy automatically sends out text messages, emails and app alerts. Download the free PumpSpy app to receive reports, alerts and check your sump pump anytime, anywhere! the PumpSpy sump pump smart outlet includes: smart outlet, screw, high water sensor, mounting bracket and installation guide. Wi-Fi network required. Protect your basement from flooding with the PumpSpy sump pump smart outlet. 57-0001 Features: -Automatic sump pump. -Powder coated cast iron construction dissipates motor heat and prevents rust for longer life. -Non clogging vortex impeller allows pump to pass small diameter solids. -100% factory tested under water to ensure quality and reliability. -US made by quality craftsman. Specifications: -Voltage: 115V. -Horse power: 1/3HP. 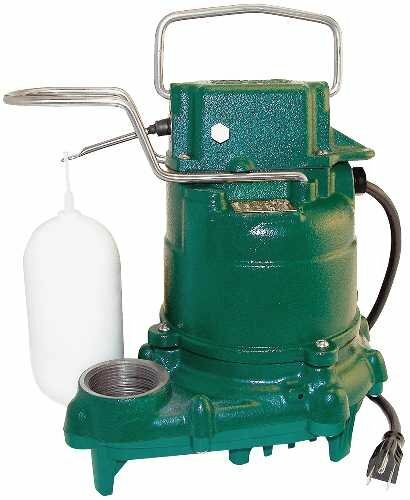 -Dimensions: 10.06" H x 10.09" W.
1/2 HP, Cast Iron, Submersible Sump Pump, With Vertical Switch, Designed For 11" Diameter Or Larger Sump Basin. 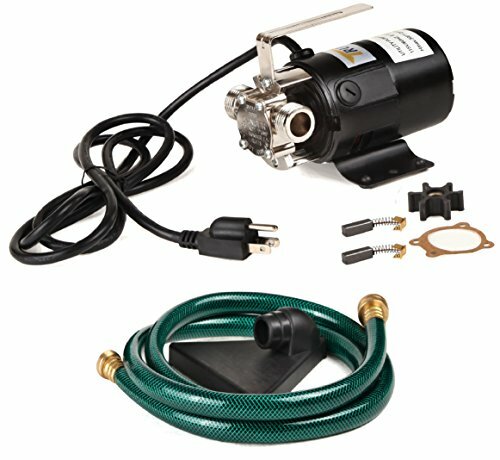 Pumps Up To 4200 GPH at 0', Durable Cast Iron Volute, Reliable, Reinforced Poly Carbonate Impeller, Corrosion Resistant Stainless Steel Fasteners, Top Suction Design Filters Debris & Minimizes Clogging, Oil Filled, Thermally Protected Motor Prevents Overheating, Designed For Easy Installation Without Any Plumbing Changes, Epoxy Coated Steel, High Performance 1/2 HP, Motor, 1-1/2" NPT Discharge & Durable Cast Iron Base, Easy Carry Handle For Portability, Float Guard Protects Switch From Hang Ups. This product is assembled in the USA. Easy installation and easy handling. 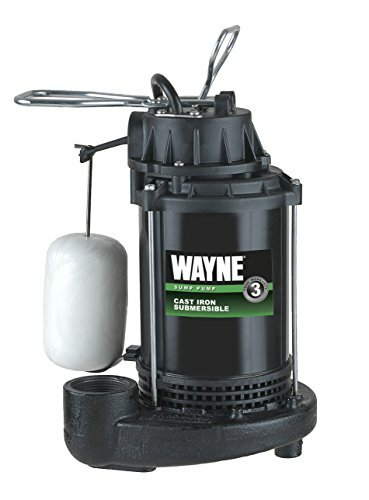 The Wayne 1/2 HP cast iron submersible sump pump is designed for work in sump pits 11 inches or larger. Its ceramic mechanical seal keeps this pump going in even the most demanding environments, and the 1 1/2-inch discharges creates maximum flow and ensures easy installation. It works 9 inches on level or 4 inches off level. A two-pole switch prevents basement flooding in the event that one pole sticks, and disconnecting 115-volt conductors prevent damage from lightning. The automatic overload mechanism prevents damage to motor windings, permanently lubricated ball bearings need no oiling, and the waterproof three-prong grounding wire with an 8-foot extension reaches distant outlets. 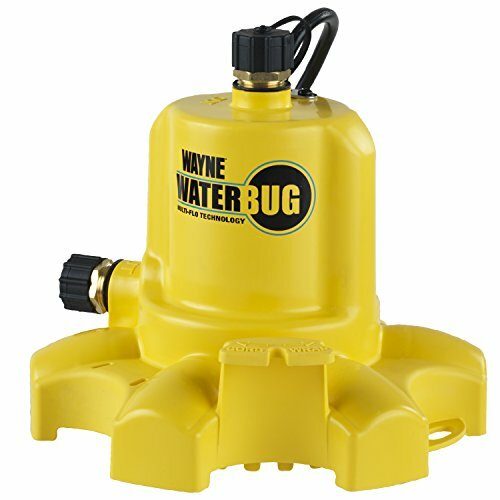 Wayne backs its pump with a three-year limited warranty. 3/4 HP Power High Efficiency - Portable and energy saving Maximum capacity of transferring water up to 3300 GPH and Max delivery height is 26ft, 2200 gallons per hour on a 10-foot discharge lift. Pure Copper Motor with Thermal Protection - Pure copper motor can bring better and more lasting work to the pump. Thermal protector ensures that the pump will not be burned out. Even when the pump trigger thermal protector, pump will rework after cooling down. Hallmark Industries MA0414X-7A Deep Well Submersible Pump, 1 hp, 230V, 60 Hz, 33 GPM, 207' Head, Stainless Steel, 4"
1HP, 230V/60HZ/1PH, 7 stage, 33 GPM Max, 207 feet head, Mid Intake, S.S. SHELL C.I Intake, 1-1/4 NPT discharge. Warning: This is 220V pump! Warranty: One year manufacturer's warranty from the purchase date for parts and labor. Why You Need a Submersible Pump? 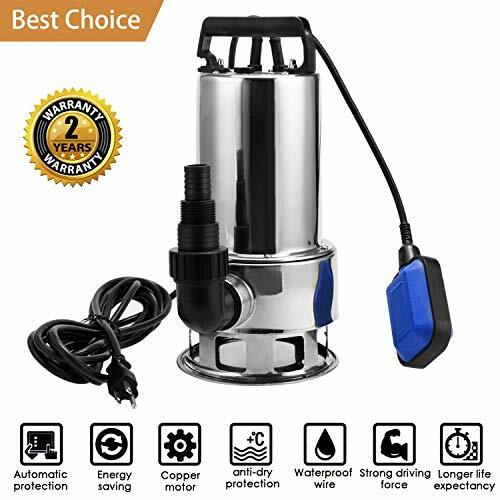 You can use the submersible pump as a helpful tool in case of flooding, a practical yard work accessory in your garden pond, or to operate a fountain. Max Lift: 16 Feet, Max Drainage Depth: 1"
Available Places: Swimming pool, Pond, flooded area. Thermoplastic body protect the metal parts from corrosion. The pump give you the excellent ability to drain cellars, swimming pool or garden ponds. Thermal overload protection make sure the pump operates within spec for longer durability. The max flow is of the pump is 2115gallon/H (8000L/H). But the height should be close to 0 meter and use the discharge port of 1.5inch. That means if you want the flow be bigger, the height of the water you put the water pump into should be lower, and using the 1.5inch discharge port. GREAT for flooded area, swimming pool, pond. Never worried again your basement will be flooded with dirty water during rainy days. Outflow Diameter: 2.4cm/1.0", 3.2cm/ 1.25", 3.7cm/ 1.44"
Why choose our submersible pump? 1.Wide application and powerful drive: The pump is not only suitable for pumping,well water, river water, fish ponds, but also for septic tanks, sewage treatment plants, mud ponds, etc. 2,the base is high, suitable for the sewage of large pieces of garbage, not easy to block, and the operation is more stable. On the other hand, the base is larger and more robust. 3.The stainless steel body is corrosion resistant and wear resistant, prolonging the service life of the product. Stainless steel is also easy to heat. 4.High-quality bearings make the products run smoothly, with low noise and low loss. 5.Waterproof wire, automatic protection, energy saving, copper motor, anti-dry protection, strong driving force and longer service life. 6.Water pump with 15 foot rope, sealed to prevent short circuit, free to disassemble the pump. 7.There are 3 different outlets to choose from. 8.Easy to connect water pipes and pumps. No need to spend more to buy one. 2. The product packaging is foamed, you don't have to worry about the damage during transportation. Powerful Submersible Pump This submersible pump is designed to handle water removal or high volume recovery work, helping to deal with heavy water accidents more effectively. The 1.5HP and 4356GPH (gallon per hour) pumping capacity helps to quickly remove water from the position, saving more time and effort. The pump consists of a 15-foot wire that is free to disassemble the pump. In addition, the cable is specifically sealed to prevent electrical shorts under water. Stainless steel Body Portable stainless steel motors are less prone to rust, which extends product life. It is non-corrosive and guarantees the service life of the pump even in sewage. The stainless steel body is easy to clean and wipe. Higher Base Plate The higher base plate ensures the collection of debris in the sump, and thermal overload protection ensures that the pump operates within specifications and extends durability. This portable sewage pump is a necessity for every house. Multi Outlet Size And Multipurpose The outlet has 3 different outflow diameters (1.0, 1.25, 1.44). 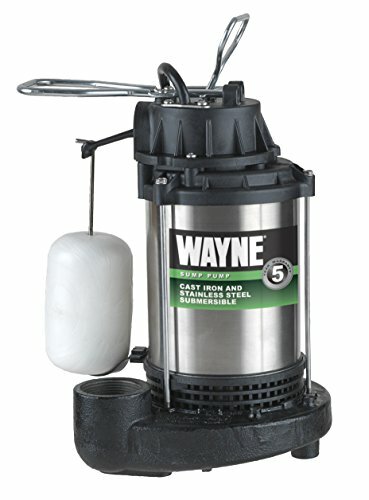 This reliable submersible pump is ideal for aquariums, fountains, flood zones, swimming pools, cellars. , garden ponds and hydroponic pump systems. How Does Submersible Pump Work As A Great Helper in Life? You can use the submersible pump as a helpful tool in case of flooding, a practical yard work accessory in your garden pond, or to operate a fountain. The pump comes with greater power(1HP) and flow rate(13500L/H or 3566 GPH) ,which will meet your needs to a great extent. The max flow is of the pump is 3566gallon/H (13500L/H). But the height should be close to 0 meter and if the height is 9 meter, the flow rate will be close to 0. That means if you want the flow be bigger, the height of the water you put the water pump into should be lower, and using the 1.5inch discharge port. There are three outlets with different diameter to choose from(1" 1.25" 1.5"). The bigger the flow is, the wider the outlet should be. That mean the 1.5 inch outlet will be used when the flow rate is equal to 3566 gallon. If the machine is applied in the water with impurities whose diameter is more than 2mm, it will do harm to the pump. High Power Featuring 750W and 3566 gallons per hour high power pumping capacity can help to move water away from locations quickly. 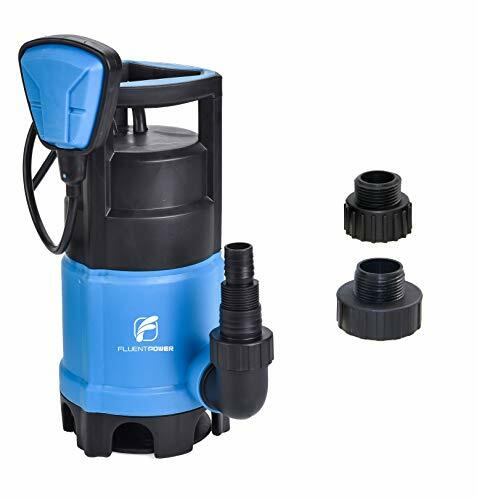 This submersible sump pump is built to handle water removal or high-capacity recycling duties, helping to handle your heavy water duties more efficiently. Automatic Float Switch When the water level rises above 8 inch, the pump will start working automatically under the control of float switch. When below 8 inch, it will automatically disconnect the power and stop working. Then you can hold up the float and continue to pump to 2 inch. Notice: once the pump can't pump any water, you should put down the float switch or cut off the power immediately. If not, that will lead to the coil burned. Ingenious Design Outlet can be adapted for different size hoses. Three fittings with different diameters for outflow (1 ,1.25, 1.5) to choose from according to the flow rate. The bigger the flow is, the wider the outlet should be. Safe and Durable The water pump has thermal overload protection to ensure the lifecycle and safety, and it adopted thermoplastic body to resist corrosion. Great For Draining Suitable for home and garden. Great for Garden Pond, Water Tanks, Pools, Hot Tubs, Flooded Areas, etc. EXTRA LONG AND SEALED CORD:The power cable is 15FT,which allows the pump to be removed free.In addition,the cord is sealed specially in order to prevent electrical short circuits while under water. One Year Warranty! A necessity of every house,Never worry again that your dry basement will be effected on rainy days or any day that the underground water table rises. GREAT for flooded area, swimming pool, pond. AUTOMATIC FLOAT SWITCH:The pump with a float switch can control start/stop Automatically.when the water level is below the initial level( 4.7 inch), it will automatically disconnect the power and stop working;When the water level rises above the initial level( 4.7 inch) the pump will start working automatically under the control of float switch.Notice:once the pump can not pump any water,the power must be cut off immediately.If not, that will lead to the coil inside the pump burned.